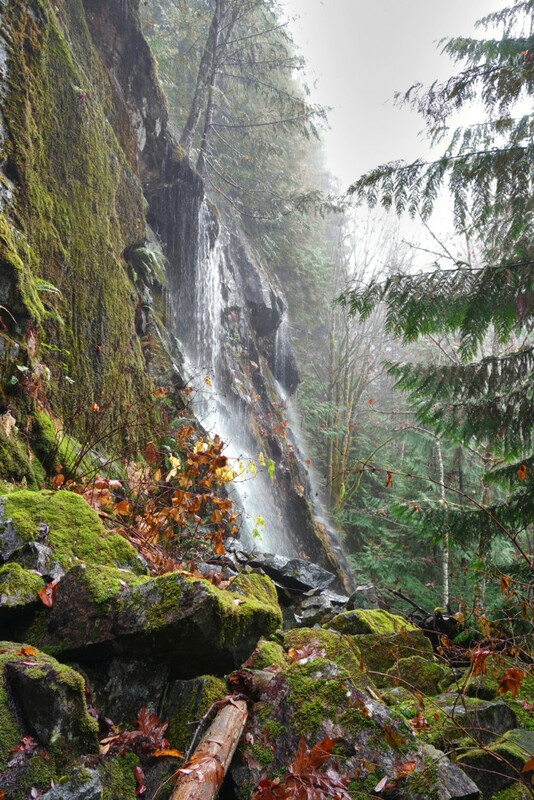 With the record-breaking rain we’ve had to date this season, it was a no-brainer to find some waterfalls to chase a few Sundays ago. 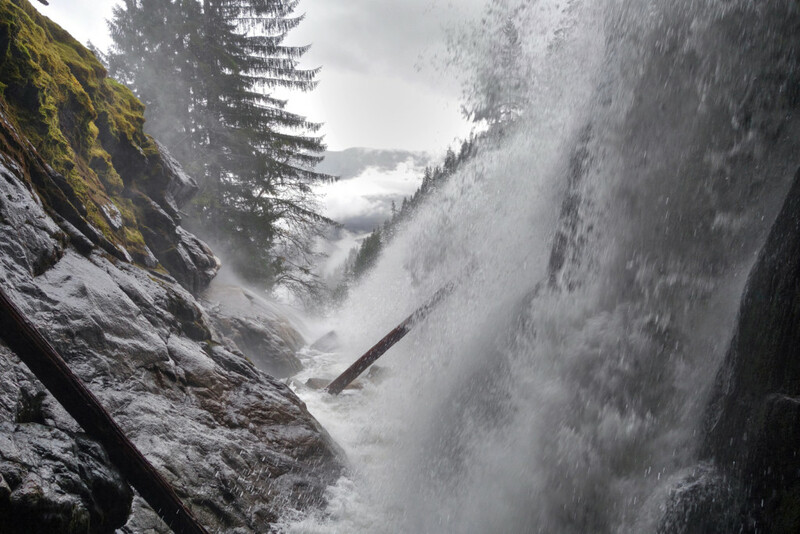 We recently hiked to Kennedy Falls and Cypress Falls in the North Shore, and I’ve spent some time exploring various cascades on Burke Mountain, including Sawblade Falls. 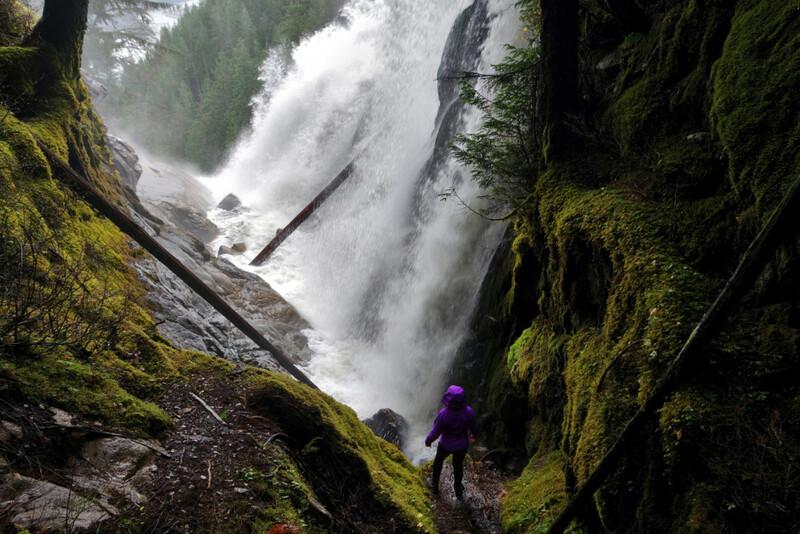 After some plan-devising, we decided to hike the Sigurd Creek Trail to Crooked Falls, located in Squamish, BC. 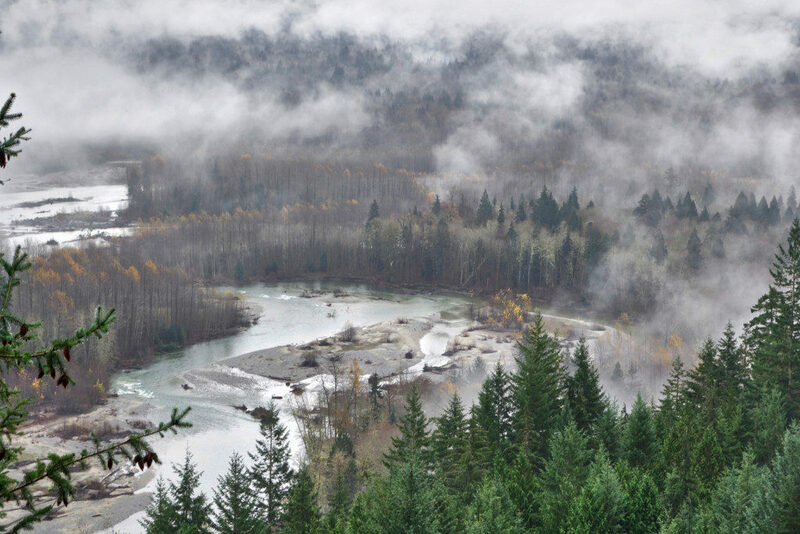 Area: Located in the Ashlu Valley, Squamish, BC. 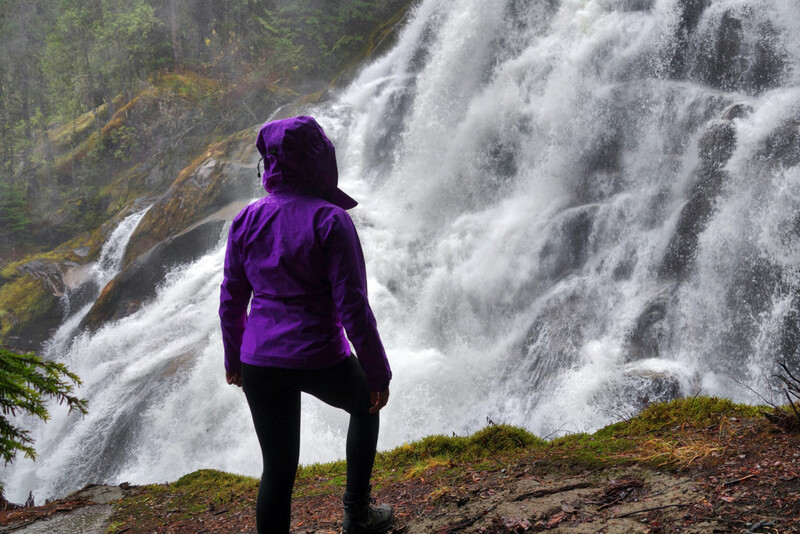 Good to Know: The falls are fantastic during the rainy seasons; be prepared for a cold spray after heavy rainfall. 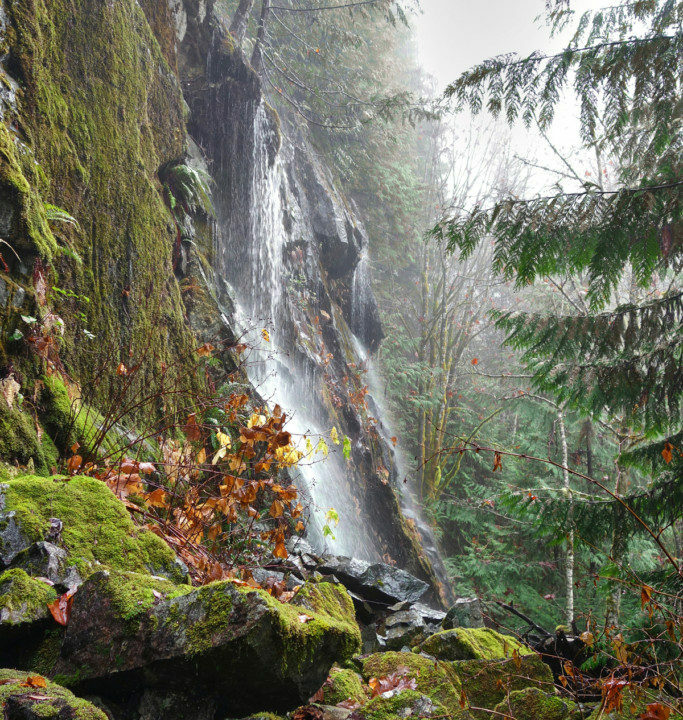 Near one of the falls viewpoints, there is a path that leads down to the base of the falls, this is well worth the short detour and minor elevation loss. Some sections of the trail are steep; overall, it is not too demanding. This is a great option for shoulder season, or if you’re pressed for time and don’t have an entire day to spend outdoors. ✓ Head north on hwy 99 to Squamish. ✓ Turn left on Squamish Main road (across from the turn off for Alice Lake Provincial Park), and continue on it past the turnoff for Paradise Valley Road. ✓ Continue until this road turns to gravel and turns into the Squamish Mainline FSR (approximately 26km from the highway). 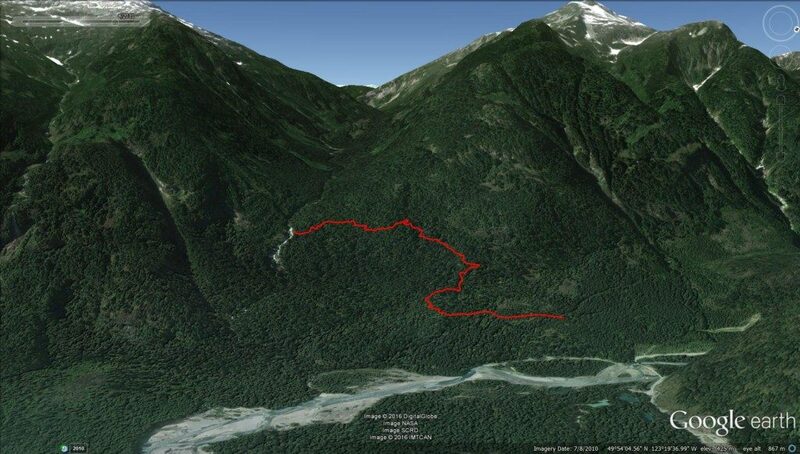 ✓ Continue along the Squamish FSR for approximately 1.3km, turn left onto the Ashlu FSR, and immediately cross the bridge over the Squamish River. ✓ Drive for approximately 2.3km to the A-200 branch (unsigned – it is where the Ashlu FSR turns right, just after the bridge over the Ashlu River). ✓ Most hikers will park here; those with a high clearance 4WD can drive further (see “Note” below). ✓ Continue up the A200 branch, keep left at all junctions, until you reach the signed trailhead to the left. Note: If you have a good high clearance 4wd vehicle, you can drive up the A-200 branch to the trailhead proper and save about 20 minutes of hiking. 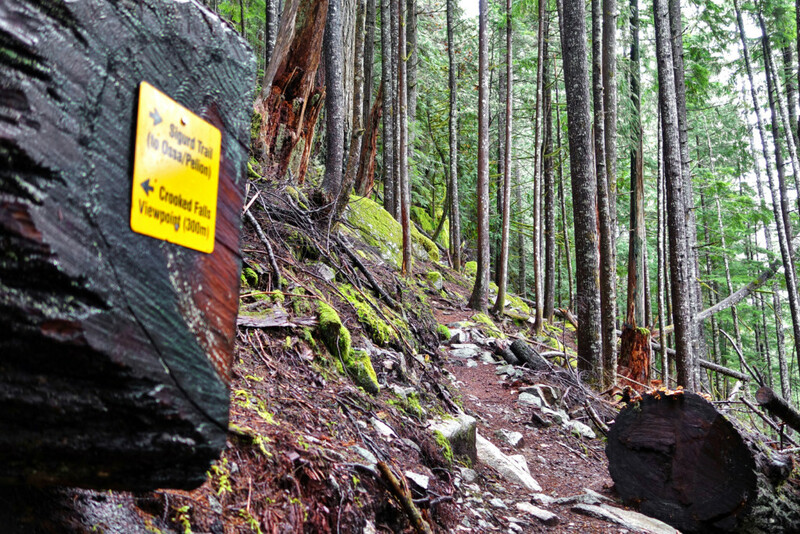 The trailhead for the Sigurd Creek trail is marked and located near the confluence of Ashlu and Squamish rivers. From the start, the ground was covered with rotting leaves; the interlocking branches around us were almost bare. This helped let some light through, just enough for bright hues of green and yellow moss to light up the forest on an endlessly grey day. 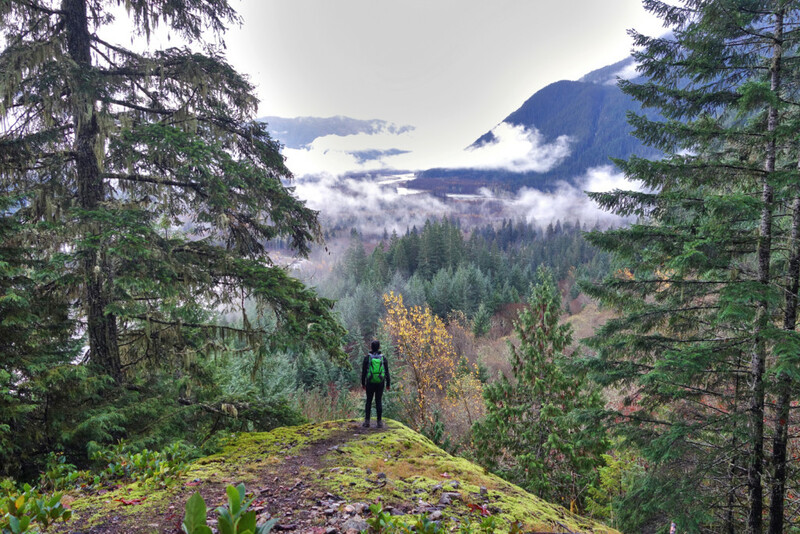 The first ~400m of the trail (still along the old roadbed, but very overgrown) were flat and offered nice viewpoints of Squamish Valley/Squamish River. We only caught brief glimpses of the views; our perspective was obscured by the clouds. The weather forecast was accurate; the sun wasn’t going to break through today. 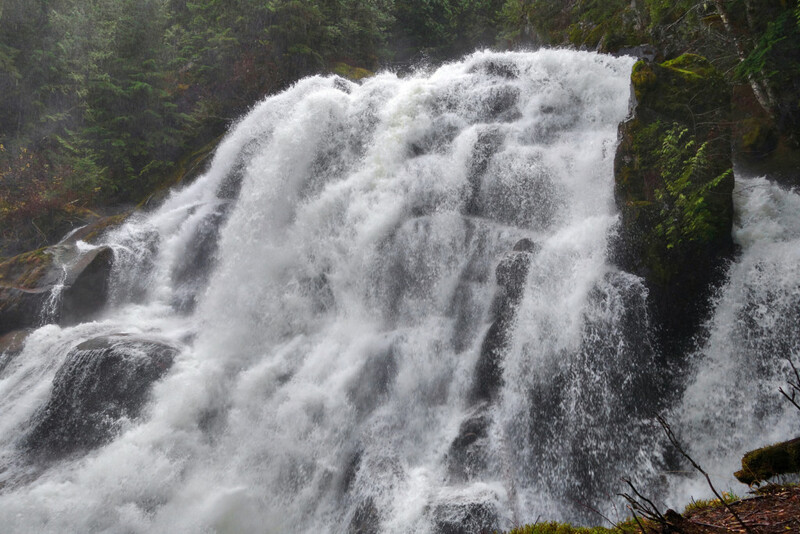 Along this section, we saw some minor cascades falling down from a headwall of rock. It almost looked like the forest above us was overflowing with all the rainfall. 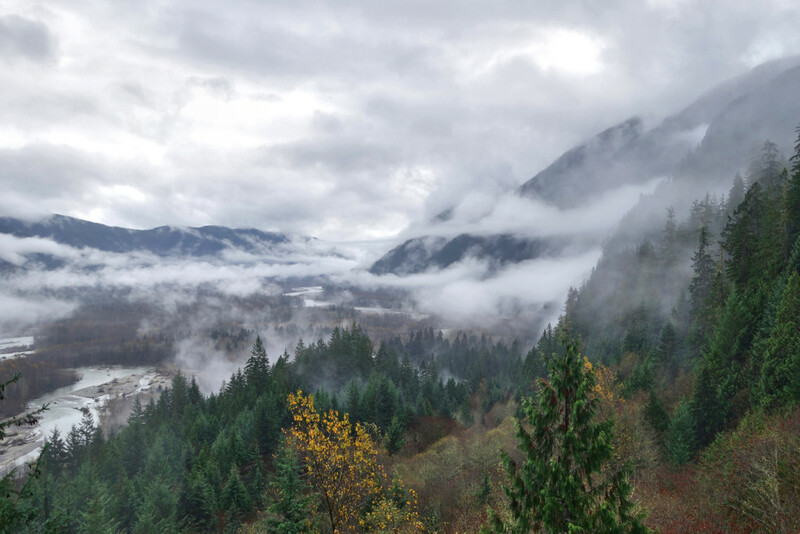 We passed one last viewpoint of the Squamish Valley on a small bluff before disappearing into the lush green forest. 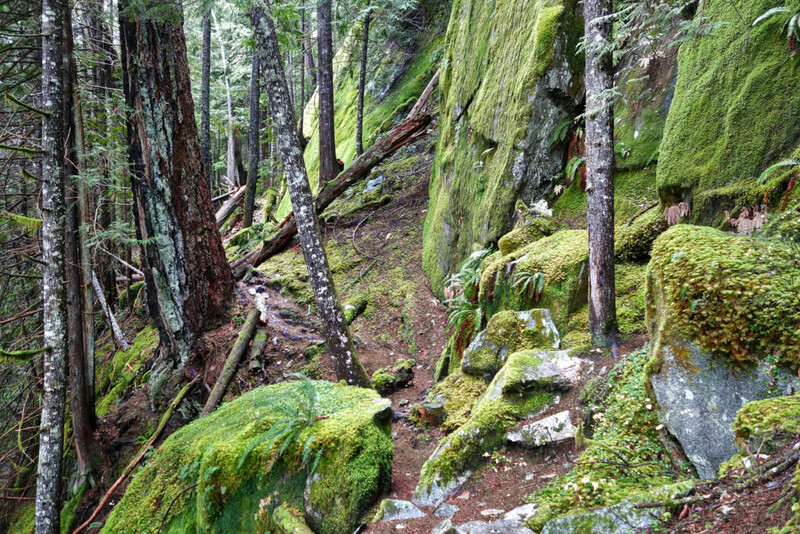 From here on, the trail climbed steeply through the trees, switch-backing here and there. 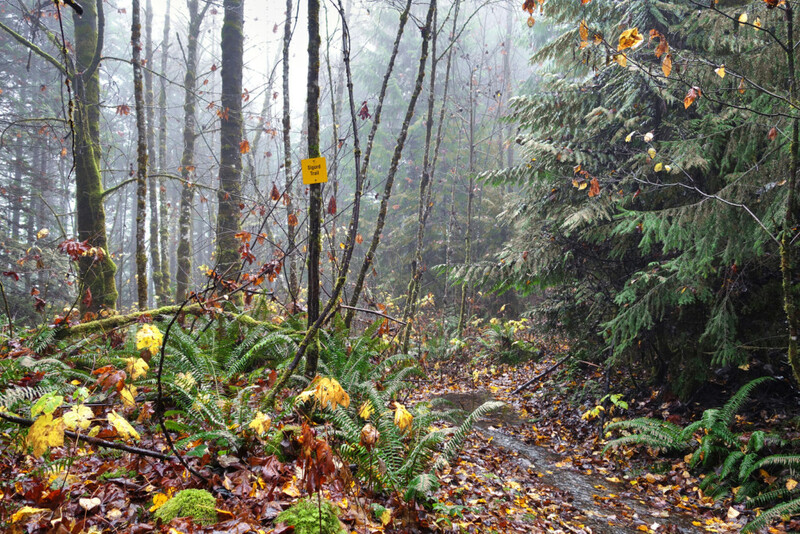 It was well marked the entire way, with a very clear trail bed and many markers on the trees. We reached a junction; right to Ossa and Sigurd Peak, left to Crooked Falls (only 300m away). As we moved through the trees, Ryan turned to me with a smile and said “hear that? It’s Sigurd Creek”. This meant the falls were near. As we drew closer, the noise increased steadily until we were only a handful of meters away; my stomach turned. We followed the trail as it descended to a bluff overlooking the falls, part way down. We stopped while we had some shelter in the trees and cinched up our gortex jackets – the waterproofing came in very handy next to the falls. 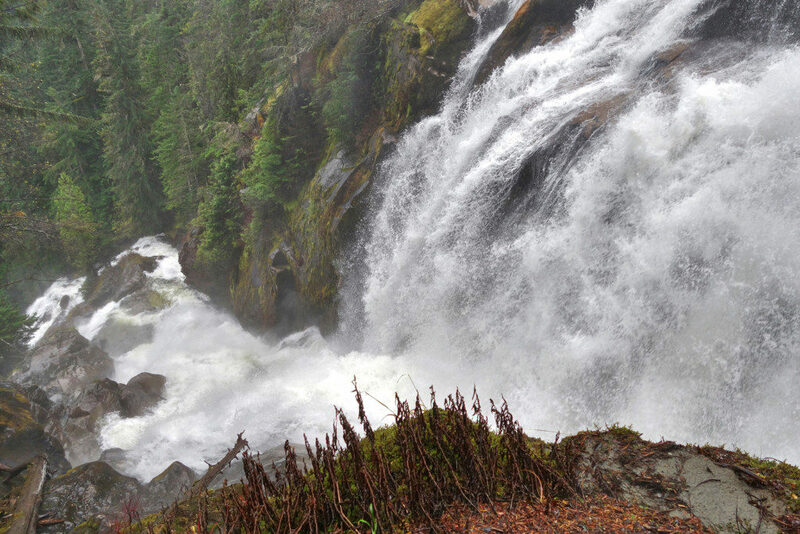 With a deep breath, we stepped out onto the bluff and into the spray of the rain-swollen falls. The torrent of water tumbled down a massive bluff made of a series of rocky outcrops; it made a sharp left turn at the base, giving the affect of it’s name, Crooked Falls. It wasn’t the gentle sort of waterfall I’ve seen many times before, the force was hard enough to crush your body on its way down, then swirl you into a plunge pool deep enough to drown you if you survived the fall. From where we were, it was awe inspiring and terrifying all at once. No doubt, the falls were gorgeous. We picked up our packs and poles and made our way to another viewpoint. Before dropping down to our first viewpoint, we noticed a trail branching off to our right, which lead closer to the base of the falls. We picked up this side trail and dropped some elevation to gain a different vantage; this one was more spectacular than the first. The Crooked Falls dropped in an almost laughing sort of way as it sprayed us from head to toe once again; we were as soaked as we would have been in heavy rainfall. We stayed away from the edge of slippery ground and admired the falls from a safe distance. I caught a bit of a chill, but no matter how sodden we became, the cold couldn’t dampen our spirits. After a long time taking pictures and appreciating the falls, we gathered our things and made our way back along the trail to the trail head. As we walked away, the ever-present white noise of the forest became more and more quiet until it disappeared through the silence of the trees. Not a ton of info to report here, I started the day with my basal reduced to 50%. My blood sugar levels were well in the normal range, likely, because it was a pretty mellow day aside from a few steep stretches.